Robuck Security can design, install, service and maintain a range of access control solutions, ranging from a single door to multiple of doors, tailoring a solution to best suit your needs. Whether you are a small commercial premise, large multi-site organisation or anything in between. 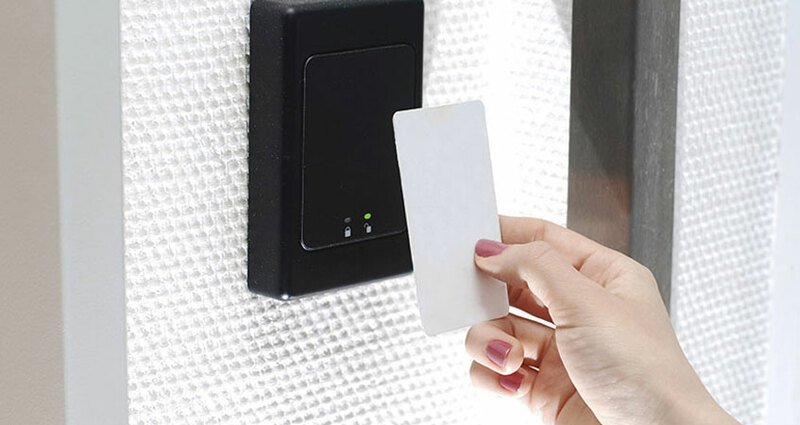 An access card (also known as a proximity card) can identify individuals and allow entry and exit to and from a pre-defined area when it’s scanned with a proximity card reader. The reader then analyses the data stored in the access cards and determines whether the user has authorised entry based on the parameters you have set. The proximity reader then records the activity for future reference or reports. Systems like these can monitor access, protect employees and provide comprehensive activity reports. As well as providing security, Access Card reports also assist with Occupational Health and Safety issues and Performance Management. All software is password protected and only allows the administrator access to the programs, networks and drives. Biometric security uses unique human characteristics to identify a person seeking entry to a restricted area. The Biometrics Access Control system can identify the unique characteristics of a fingerprint, for example. It can then regulate entry permitting only authorisedusers access to an area. This system is able to eliminate stolen, loaned or lost electronic access cards by using an individual’s distinguishing features to prevent unauthorised access.